Here at Mr. Kitchen Faucet, we’ve hunted high and low to bring you all the information you need – so you can find the best faucet for your kitchen. Our expertly researched reviews of top rated kitchen faucets will help you find the right model to complement your home and suit the needs of your family. We’ve reviewed a wide range, from a traditional brass kitchen faucet, all the way to modern kitchen faucets. Whatever your taste, you’re going to find a faucet that looks the part, and works like a dream after you’ve read our best kitchen faucet reviews. Which Kitchen Faucet is Best? Read My Kitchen Faucet Reviews & Find The Right One For You! There are two main types of kitchen faucets, single lever and two-handed. Aside from that, there are adaptions of these two styles for more specific uses, depending on the needs of your kitchen. These can include accessories like soap dispensers, a sprayer, or are specifically adapted for their requirements, like prep stations and wet bars. This faucet includes only one tap, which you subtly rotate on a pivot to adjust the hot and cold temperature. You need to make sure you have enough space behind the handle before you opt for a single handle faucet. Otherwise, it may be difficult, or even impossible, to use if it hits the wall behind it. A kitchen faucet with a separate handle often has a very chic look – great for a glamorous kitchen. Any additional countertop holes can be used for features like a sprayer, or a soap dispenser. Better ease of use than their two-handed counterparts. A two-handle is for those who want more traditional kitchen faucets in their kitchen, as this is the time-honored assembly. It includes two taps, one hot and one cold, that can be used individually or in combination to provide the best water temperature. The handles are typically part of the desk plate, and the sprayer is more often separately mounted. With a pull-out/pull-down faucet, the spout is coiled on a hose and can extend further into the basin when lightly pulled. The faucet is on a counterweight, which means it will neatly retract back into the body of the spout after each use. Most of the best touchless kitchen faucets come with an activator at the front of the spout, so just the lightest motion will do it, and a small handle lets you adjust the temperature. These are popular in commercial kitchens because they’re much more hygienic. Before you choose a faucet for your home, commercial, restaurant, or for industrial use, make sure you are buying the most reliable product from a professional supplier. Often, the best guarantee of quality is knowing where to buy faucets and being informed of who makes the best kitchen faucets. With that in mind, we do the hard work by researching and composing lots of kitchen faucet reviews. Lucky for you, we’ve done the work, so you don’t have to. Our expert team have taken the time to research the top-rated kitchen faucet brands, so you can make an informed choice about exactly which one will provide you with the best kitchen sink faucet for your needs. The suppliers we’ve surveyed span price ranges, from cheap – as price, not quality – to high-end, luxury faucets. They include faucets that are American-made, but even of those made abroad, you’ve got our seal of approval. These are the best quality faucets you can find on the market today. Is there a more popular kitchen supplier than American Standard kitchen faucets? American Standard can proudly boast that three out of five homes in America contain some supply from American Standard. For over 140 years, American standard has been making faucets, and that long legacy has resulted in a company that’s perfected its craft. 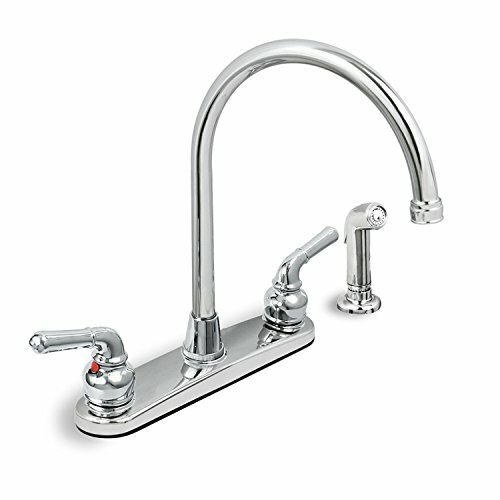 You can rely on American Standard for high-quality faucets for both homes and commercial kitchens. They’re concerned with good health and clean water, so trust in American Standard for a faucet that will sustain. Delta faucet is proud to call themselves innovators in the market – and they truly deserve that title. Delta kitchen faucets have advanced the whole industry, with their revolutionary developments in touchless technology, and their mechanism that allows water flow with the mere tap of an elbow. They are a company that passionately believes in the transformative power of water, and that every complex problem has a simple solution. This credo comes through in almost every Delta design – their faucets are elegant, whether their style is traditional or modern. Every piece of technology they use is seamless and non-invasive with a great ease of use. Delta makes some of the highest quality faucets out there – and with good reason. They test every single faucet 500,000 times to guarantee no leaks. The quality of their products means their reputation as one of the best faucet makers in the industry is secure. They’ve been producing faucets since 1901, so you can be safely assured that Hansgrohe kitchen faucets are reliable, durable products, coming from a company with over a century of expertise. Buying a Hansgrohe faucet means buying from a company that has built on their traditional faucet making techniques and has expanded into the modern market with aplomb. You can guarantee each Hansgrohe faucet is of the highest quality, and, as a bonus, each one is environmentally friendly. Kohler is one of the most prestigious American plumbing companies in the world and may just be the oldest. Many people consider them to make the best kitchen faucet in the world. Kohler was founded in Wisconsin in 1873 and is still based there today. It is clear they’re proud of their heritage – many Kohler kitchen faucets are made in America. Their commitment to delicate, enchanting design is obvious, and it’s combined with an excellent quality product. With Kohler, you get a union of beauty and brawn. Many professional plumbers recommend Kohler as one of the top kitchen faucets on the market today! Kraus is relatively new to the faucet business, but that doesn’t mean Kraus kitchen faucets are anything less than excellent. Since their founding in 2007, Kraus has been striving to make cool products that reflect the city they call home: New York. Their design manages to be practical and convey a real spirit of modern and cool. The attitude of the company is modern too – they are committed to sustainable, environmentally friendly products. Mirabelle aims to put the home at the forefront of every design. All Mirabelle kitchen faucets and their other features aspire to create a sense of comfort and cleanliness. They know the power that a beautifully designed home has to restore and renew the spirit – and each of their kitchen products aims to do this with great success. Mirabelle has a real focus on design and has managed to create affordable products that are aesthetically pleasing in a classic sense, while still being innovative. You won’t pay an extortionate price for any item in Mirabelle’s range, but you won’t be losing out on a durable kitchen faucet either. Moen was founded in 1937 by Al Moen, from whom the company gets its name. Moen kitchen faucets have something that sets them apart from other faucet makers – their focus has been on the faucet since the start. It was Moen, the founder, who was the first man to develop the single-handed faucet. Today, Moen is still head and shoulders above other players in the industry. Moen has developed products that won’t tarnish over the course of a lifetime, and each faucet perfectly balances the individual water pressure of your home. Many of their products are American made, too. Best of all, you can rest assured knowing there won’t be any unexpected leaks with a Moen product – each faucet comes with a Limited Lifetime Warranty. They’re as confident in the quality of their products as we are. Premier present themselves as a no-nonsense company. There’s not an extensive emphasis on design in their press releases – simply a clear focus on just how well-made are their high-quality products. This is surprising because not only do Premier kitchen faucets provide great quality, but their designs are just so lovely. If you’re looking for faucets that have the vintage charm of a traditional home, Premier is a solid choice. They do the most extensive range of gorgeous and homey, vintage-inspired designs of anyone on this list. However, that’s not all – if you’re looking for a modern faucet design, theirs are quirky and charming. Saying this, Premier has every right to emphasize the quality of their faucets – because they are just that good. Each Premier faucet is extensively hand-tested to ensure its ready for a home, and every single one comes with a Limited Lifetime Warranty. Pfister has been in the plumbing business since 1910 and is keen to let consumers know they have more expertise than some of their peers. Pfister kitchen faucets bless consumers with an expansive range of design options and styles to choose from, and it could perhaps be the widest range in the industry. There are over 80 different collections and over 20 color options – if you don’t have an idea in mind, Pfister offers great inspirations. If faucets can ever truly be cool, Vigo kitchen faucets are that manufacturer. Vigo focuses on making sure their faucets always look great, and they excel in that. In fact, they’ve done so well in the faucet biz, they’ve been named one of the fastest growing companies in America. It’s not just great design that you get with a Vigo faucet – you can be assured you’re taking on a high-quality product. They focus on making sure each product is perfect. And what’s more? They exceed all the environmental safety requirements required. Conscientious and cool. Navigating the faucet market can be difficult. There are so many different shapes, styles, and designs that choosing the right one can become confusing. However, to make the buying process a little easier, there are some things you should consider that will help inform your ultimate decision. A big detail to keep in mind when researching the best kitchen faucets – perhaps the most important and defining detail – is what type of plumbing is in your house. You may find that your existing faucet isn’t compatible with some faucet models and styles. Even if you’re installing a whole new model, you will need to find out the amount of faucet-mounting in your sink. If you’re not planning to update your sink, and only update your faucet, take a good look at how many mounting holes your sink has. Most sinks come with pre-drilled mounting holes. If your sink has 4 holes, but the faucet you’re installing has 3 holes, you could run into a problem with some makes. However, some of the best faucets give you the option to change the hole configuration, so you can fit whatever faucet you choose. Just be sure to keep your eyes peeled for information about that. 1 hole kitchen faucet: This faucet is the bare minimum of what you need; a single faucet. 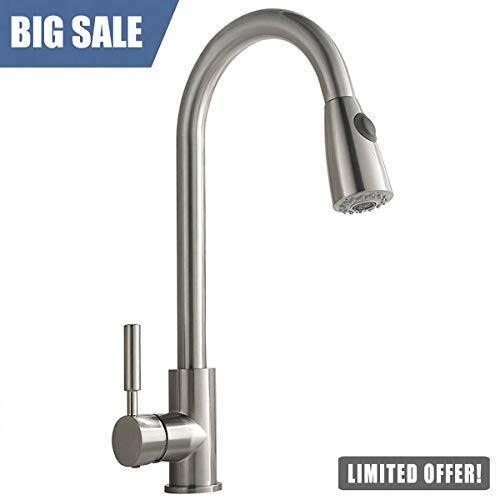 2 hole kitchen faucet: The 2 hole faucet allows one hole for the spout, and another for an accessory, like a spray head or a soap dispenser. 3 hole kitchen faucet: A 3 hole kitchen faucet is the most common kind of faucet in a home and allows for a spout and up to two accessories. It typically comes with the escutcheon to cover the holes, or a deck plate, as it is also known. 4 hole kitchen faucet: The 4 hole kitchen faucet is probably the most common in industrial kitchens. As well as having the holes for the spout and the two taps, there’s an additional hole installed for a soap dispenser or sprayer. Before commencing on your mission for a new kitchen faucet, another thing to investigate is the water line size and shut-off valves. It’s sensible to be conscious of the size of the pipe and the size of the models you’re considering. You should replace the shut-off valves when installing a new faucet. Improving the overall aesthetic of your home is a common motivation behind installing a new kitchen faucet, and it goes without saying that the new one should complement other details in the kitchen. Your new shiny chrome faucet will look out of place if your kitchen doesn’t boast other sparkling chrome detailing and is more rustic-themed, for instance. Selecting one of the best kitchen faucets is advised when you’re redesigning or doing-up your entire space so that you can marry different aspects together. For example, if your home is modern-looking, but you want to make it more stylish, phase in a new theme subtly. Start with a matte bronze faucet, for instance, and then buy matching drawer knobs, light fixtures, and so on. Little style details go a long way in revamping a living space like the kitchen, and a new faucet is a great starting point (while also practical). If you’re shopping around for a new kitchen faucet, you should consider what features you want yours to have. When it comes to handles, do you want a one-handled faucet, a two-handled faucet, or do you want something more high-tech, like a hands-free faucet? Single-Handle Faucets: Deciding between a single-handle faucet and a two-handle faucet mostly comes down to style preference. There are pros and cons for each type: a single-handle faucet is great for easy-use, is easier to install, and takes up less space than a two-handle faucet. However, the downsides of this type are that temperature adjustments aren’t as precise, and you will need to consider whether there is enough space behind the sink for the handle to rotate behind. Two-Handle Faucets: Two-handle faucets, on the other hand, are great for precise temperature adjustment, as you will have a cold tap and a hot tap, and can adjust them accordingly. However, they are generally more difficult to install. Often, the most reliable kitchen faucets come in a two-handled version. Don’t underestimate the possibilities of spouts, either. Do you want your kitchen spout to be long or short, or with a high arc? The possibilities are endless. Faucets with high-arcs (raised 8-10 inches above sink) are particularly popular with chefs and people who love to cook, as they allow more workspace around the sink (as well as being stylish). However, the space above your sink may already be occupied by an inbuilt cupboard or perhaps a window, in which case a faucet with a high arc won’t work for you. Another important feature is the sprayer. There are three common types of sprayers: pull-down, pull-out and side spray head. A sprayer faucet generally allows better reach and maneuverability, making washing dishes or washing vegetables, for example, easier and more enjoyable. However, if you have a small sink, this feature won’t be for you, because there’d be too much splash on your worktops or the floor. There are countless faucets on the market, but which one of the best rated kitchen faucets is truly the best, and which one do you go for? Here we’ve rounded up the best kitchen sink faucets and provided ratings so that you can make an informed decision. For the ultimate high-tech kitchen, why not opt for the touchless/motion detection faucets? You won’t have to use the handle to turn on the water when washing dishes – simply put them under the faucet, and the touchless technology (powered by a battery) will start running water. This means if you’re carrying a heavy pan with both hands to the sink, you won’t have to put it down to turn on the water. Plus, you won’t have to worry about dirty fingerprints all over your kitchen! Delta offers some of the best touch kitchen faucets on the planet. Also, most of their models come with a high-tech touchless version as well, so you’re guaranteed to find a faucet that suits your style and your needs. Pull-out and pull-down faucets are incredibly popular with homeowners as well as large kitchens and hotels, and it’s not hard to see why. With a pull-out faucet, you can turn the spray wand 360-degrees, making it easier to wash big pots and pans. Similarly, the best pull-down kitchen faucets allow you to pull the spray wand to give greater pressure to the dishes you are washing. Like pull-out faucets, they are well-suited to large, modern kitchens and large sinks. Although a faucet can be a big investment, most companies offer a long warranty (sometimes a lifetime warranty), so long as you look after it properly. This gives peace of mind as you don’t want to fork lots of money on a special, high-tech faucet with all state-of-the-art features included, for it to become faulty a year later. Manufacturers such as Kohler and Delta offer a limited lifetime warranty on their faucets. However, improper cleaning and care will void the warranty. Check your faucet’s warranty agreement before you purchase. As with anything, kitchen faucets can bring about some issues, and it’s not uncommon to run into some problems with installation, leaks, loss of water pressure and rusting. When you face a problem with one of the faucets in your home, it’s easy to conclude that the manufacturer is at fault or that the faucet is too old and need replacement. Truth is, this is rarely the case, as faucets are built to last. To avoid handing over a lot of money to a plumber or purchasing a whole new faucet, you should see below to see if the issue has an easy DIY fix. One of the most plausible reasons you may be experiencing issues with your faucet is down to the installation. Most of us are keen to save a few bucks and complete the installation ourselves, but if not completed with the utmost precision and accuracy, complications are likely to arise down the line. If you are going to tackle faucet installation yourself, it’s advisable to take your time, follow instructions meticulously and check internet forums and video tutorials. With incorrect installation comes the likelihood of leaks. Most households experience leaks in some form or another, and unfortunately, highly-advanced faucets are not exempt from this eventuality. In some cases, a leak could indicate that yes, your faucet’s shelf-life has expired, but depending on the type of leak (i.e., a leak around the base of the spout or a drip when it’s switched off), you can often just replace parts, such as the O-rings which generally don’t last as long as the faucet itself. Rather than installing a whole new faucet, refer back to your manual and take a trip to the hardware store – you’ll have the problem fixed in no time and at a small expense. Another common problem homeowners can face regarding their faucets is the loss of water pressure. This can be frustrating, especially if you have high expectations for your faucet, but the problem isn’t as serious as you may suspect. Loss of water pressure may simply be down to a build-up of mineral deposits and lime-scale. Therefore, it may just be a case of taking the faucet apart (most modern faucets can be taken apart quite easily) and cleaning the inside. In fact, you should do this task monthly or quarterly anyway to avoid this issue from reoccurring. If the loss of water pressure isn’t because of a build-up of lime-scale, it could be because of a wider problem, in which case you should call your plumber. Regardless, loss of pressure is rarely down to the faucet alone. Keep in mind that improper care and cleaning of your faucet (e.g., it becomes rusty) could void your warranty agreement. A kitchen faucet is the hub of your kitchen – where your whole family cleans, cooks, rinses and gets water from every day – and your kitchen is the hub of your home. So, you could argue that your kitchen faucet is the most important feature of your entire home. Not convinced? Here are 3 good reasons why your kitchen faucet is important and why, if you haven’t already, you should invest in a new one. A New Faucet Will Transform Your Kitchen: If you feel like your kitchen could do with a refresh and revamp, the kitchen faucet is the best place to start. Want to incorporate a new theme throughout your home? It begins with the faucet. Want to make your kitchen more high-tech and intelligent? An advanced kitchen faucet with smart features should be top of the list. It Will Improve Your Life: It may sound dramatic, but faucets with a sleek design and innovative features will bring more ease into your life. Are you sick and tired of washing stubborn stains off big pots and pans in a small kitchen with weak pressure and a small faucet? Are you fed up with dirtying the faucet handles every time you go to wash your hands? A fancy, intelligent kitchen faucet will put a stop to all these problems. Being in the kitchen will be more enjoyable than ever! Whether you want a touch-operated faucet, or think a two-handled model will be best for your family’s needs, you’re sure to find your perfect fixture within our Mr. 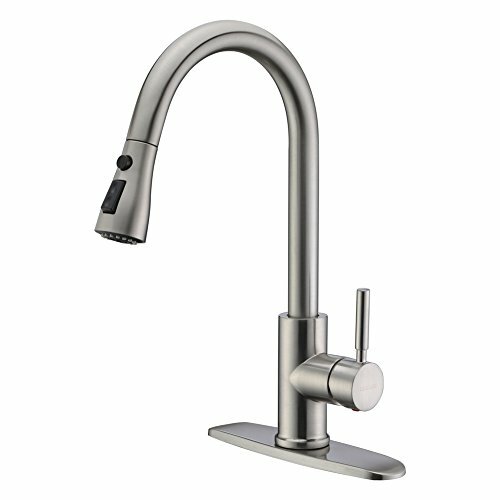 Kitchen Faucets guides and reviews. All our kitchen faucet reviews are unbiased, thoroughly researched, and aim only to help you find the best faucet for your needs! We’ve put together our extensive, in-depth guides detailing models from Mirabelle to Kohler simply to help you decide on the best new addition to your home. Whether you want improved convenience with features like pull-down hoses or touch-sensor technology, or you’re looking to enhance the style of your kitchen, we’ve reviewed all the best fixtures to help you find the perfect one for your lifestyle and interior décor. Before choosing a model, be sure to read a selection of our reviews, so you get a wide overview of what’s available and which style and function are best suited to your kitchen. If you need a professional restaurant-style faucet or just a simple traditional tap, we’re confident that the model for you is featured here on our website. I hope my guide helps you in selecting the right faucet! Please reach out to me if you have any additional questions and I'll do my best to help.